In the U.S., the foreclosure market is booming, with properties in some of the hottest spots selling at bargain-basement prices. In Calgary however, the picture is quite different. There are very few bank owned homes (otherwise known as REOs) on the market, and there aren't many deals to be had. 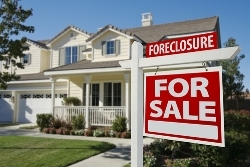 In Canada, it's illegal for a bank to sell a foreclosed home for below market value. Calgary foreclosures must be assessed and listed at market value, which means that buyers don't end up seeing much savings when they opt for foreclosures over traditional sales. There's also a lack of inventory to choose from on the Calgary foreclosure market. Homeowners in Alberta are not defaulting on their mortgages as often as their American counterparts, who've been hard hit by the economic downturn. In addition to a lack of savings and selection of available properties, bank owned homes are also risky purchases. This is because they're sold in as-is condition, and in many cases, bought sight unseen. Foreclosures pay off for some investors, but for the most part, they are more trouble than they're worth. Regular re-sales and the purchase of new construction offer far less risk, and provide better protection against financial loss than REOs. These are your best bet when looking for a new home. Contact us for expert advice on buying bank owned real estate in Calgary.